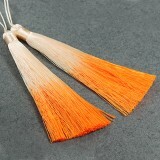 Tassels are popular products for making jewelry, most often using tassels for earrings that resemble boho, ethical style. 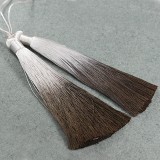 Fringes blend well with all kinds of beads, blanks, making it easy to create a necklace or bracelet with such a pendant. 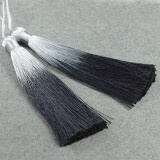 In our offer you will find two types of tassels, including one with a metal tip. 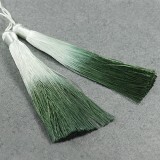 Tassel is now a very popular product for earrings or bracelet. These earrings look very light and pleasant. In our store you will find a tool for making tassels that will help you create them. Buy tassels the cheapest, at the best prices we offer them in retail and wholesale packs, the possibility of discounts and free shipping. They can be used to create jewelry, as tassels for bracelets, but also for various types of handicrafts, such as decorating clothes, creating keyrings, etc. Chwosty is currently very fashionable additions to jewelry, mainly due to many famous people who are flaunting with such ornaments. Most often they are used to make fancy earrings, elegant necklaces or original bracelets. 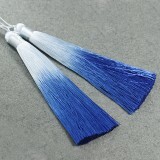 Tassel are semi-finished products for jewelry, which can also be used to renew our old handbag, sweater or blouse. 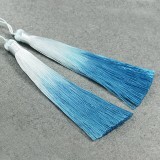 Although tassels are most often used to make minimalist, full of elegance ornaments, such as hanging only one tassel on a line or chain, you can successfully create more unconventional works and add, for example, glass beads, semi-precious stones or wooden jewelry blanks. After this combination, our decoration eg earrings will take on a more original, extraordinary appearance. Tatters also blend well in company such as a silk string or a line for jewelry. You can buy canvases in a large number of colors, which gives you a wide range of possibilities when using them.